Next week, May 9-12, Bari Conservatory in southern Italy, on the Adriatic, is hosting a totalism festival, titled “Embracing the Universe.” It was organized and is directed by pianist Emanuele Arciuli, who is perhaps Italy’s greatest advocate for recent American music of a more populist bent. (I had announced the festival for last September, but it was postponed.) You may remember totalism. Emanuele and the Conservatory Orchestra will play four of my works – Serenity Meditation, Sang Plato’s Ghost, Earth-Preserving Chant, and excerpts of Transcendental Sonnets, along with music by friends of mine: Bernadette Speach, Mary Jane Leach, and Michael Gordon (see poster below). 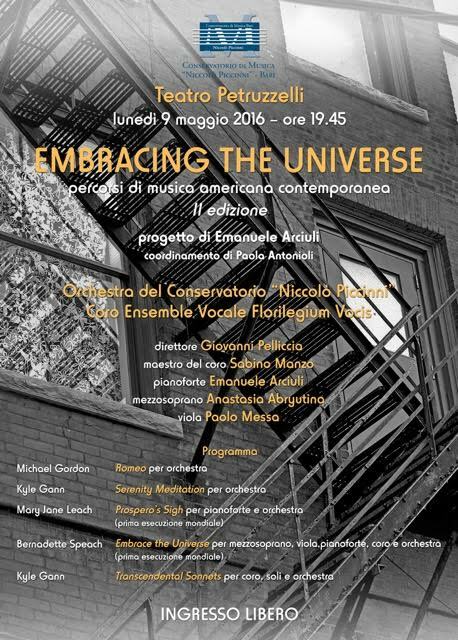 Bernadette, whose ancestors are from that part of Italy, is finally getting a premiere of her 2001 chorus and orchestra piece Embrace the Universe , and, since it ties in with the idea of totalism, thus the festival’s title. I’m giving a lecture on totalism on the 11th, and since I have to miss a week of teaching anyway, my wife and I are spending the weekends as well. I may eat a lot. Bari is great. You will certainly eat well. We had an extraordinary lunch at Al Sorso Preferito 2, Via Vito Nicola De Nicolò, 46. 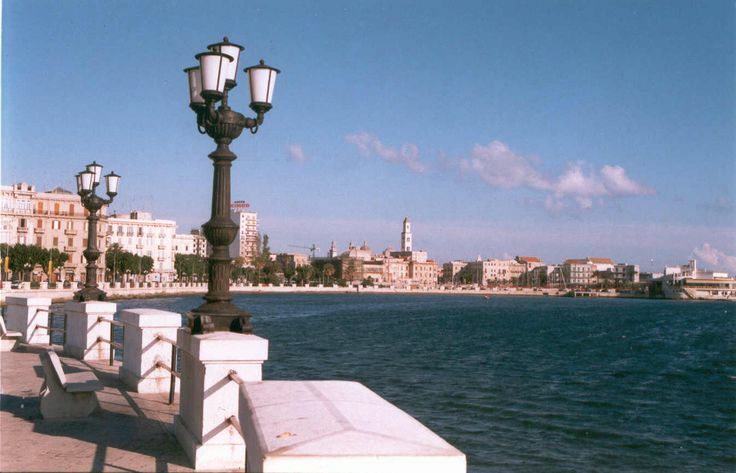 If you have time and wheels, Trani, up the coast, is worth a side trip. KG replies: Thanks, Paul, we will have the time. Oh, that sounds great. Buon viaggio!